Such scenes eased the fears of expectant mothers by depicting positive birthing images. During this time, midwives were female. Men were not present at births unless a doctor was required in the case of a high status mother. Here, a woman reclines on a couch covered in drapes, attended by three women. They are dressed in classical Roman robes and one is holding the baby. The text is also relevant and beneficial to contemporary women looking for positive images to use in the visualization of birth. 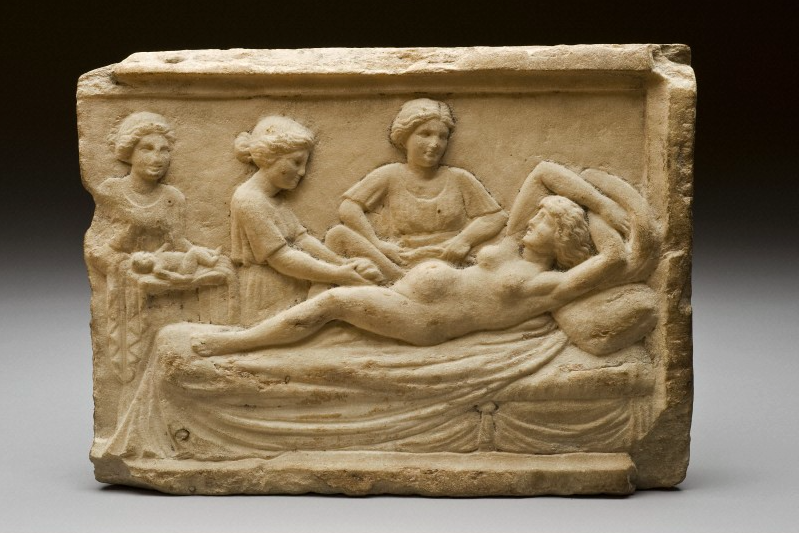 Attended to by a group of midwives, the birthing woman looks relaxed as she appears to be delivering either the placenta or a possibly even a second baby while her first newborn is brought to her from one of the group’s women.